Several tiny satellites are featured in this image photographed by an Expedition 33 crew member on the International Space Station. The satellites were released outside the Kibo laboratory using a Small Satellite Orbital Deployer attached to the Japanese module's robotic arm on Oct. 4, 2012. Credit: NASA. By 2020 the first batch of CubeSats, small satellites measuring 10 x 10 x 10 cm, will launch on a cargo resupply mission to the International Space Station (ISS). Once safely on-orbit they will be transferred by astronauts to the ISS in preparation to be launched using the NanoRacks CubeSat Deployer. It’s even possible that astronaut Jeremy Hansen might deploy them if his first mission coincides with the arrival of the CubeSats. In 2021, the second batch of CubeSats will arrive at the ISS and follow the same routine. The importance of this project can not be minimized. While CubeSat development in Canada is not new, developing the skillsets across the country is relatively new. The University of Toronto Institute for Aerospace Studies Space Flight Laboratory (UTIAS SFL) has been a small satellite innovator for 20 years. The Canadian Satellite Design Challenge has been providing mentorship at the university undergraduate level for several years but has not been able to provide the end-to-end experience which includes the launch of the satellite, the on-orbit operations and scientific results. The press release included the following statements describing the project. “Young Canadians are the innovators who will take the Canadian Space Program into the future. What better way to learn about space engineering than to design, build, launch and operate your own satellite? It should be noted that when the project was first announced it said only 13 teams would be selected. However, in the end they selected 15 teams which says a lot about the interest and quality of the teams. The teams will be guided by university professors and experts from the CSA and industry. The CSA expects 532 students to work on this initiative. The cost of this national skill building project? $8 million over four years. That’s an average of $2 million per year. That’s less than 1/2 of a percent of the Canadian Space Agency budget on a given year. So why didn’t this project happen sooner? Politics and lack of leadership. While the UTIAS Space Flight Laboratory has been leading the way in Canada, other institutions have wanted to do more in the small satellite sector for some time. The interest goes back more than a decade. Interest finally led to a 2010 CSA hosted workshop on Suborbital Platforms and Nanosatellites. It was clear then that the Canadian academic community wanted to move forward with the development of more small satellites. 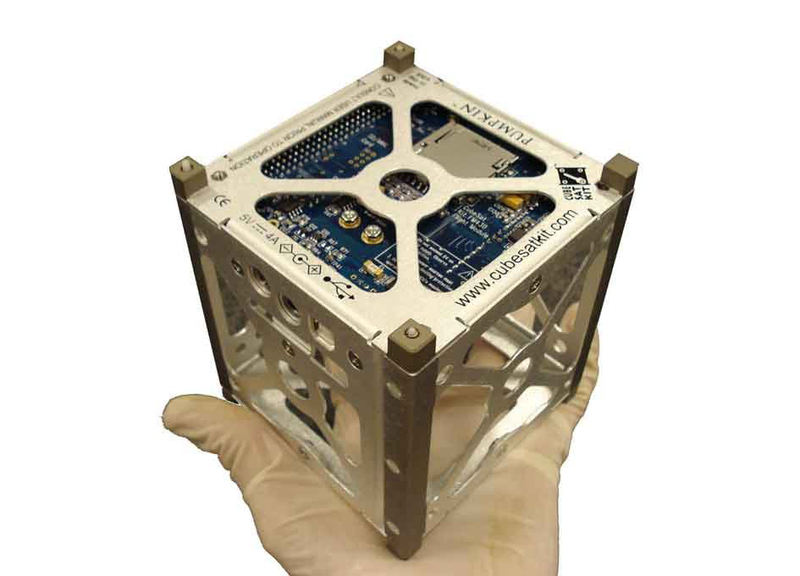 Then in 2012 at CASI ASTRO, the First Canadian Nanosatellite Workshop was held. It was clear from this follow-on workshop that the community was once again pushing for more to be done in the small satellite area. 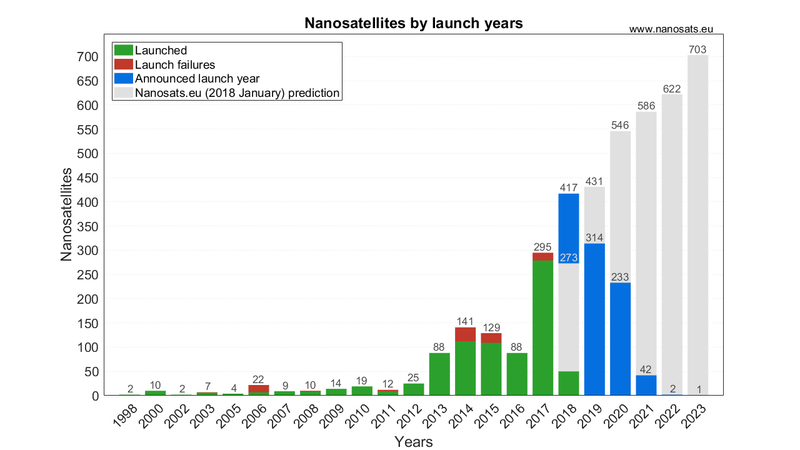 Yearly launched and planned CubeSats as of March 2018. Credit: Erik Kulu – nanosats.eu. Nanosatellites and microsatellites have demonstrated a capability to serve operational needs in a cost-effective manner. Government agencies and funding organizations should explore ways to pool their resources together in order to create a fiscally achievable support program for Canadian nanosatellite development. Current Canadian funding programs should provide incentives for nanosatellite programs to seek and engage with international programs as a means of maximizing the leveraging of Canadian funds. A Canadian program analogous to the U.S. National Science Foundation’s Cubesat program should be considered. The Canadian community should coordinate its efforts with the goal of designing, building, launching and operating a series of nanosatellite missions. Very little happened as a result of these workshops in the real sense. The CSA did try and move forward with an effort to fund 4 or 5 small satellites, but that plan was shelved. It was also at a time where the Conservatives were in power and the CSA was perpetually in the doghouse. Finally in 2015 under new leadership, what would become the Canadian CubeSat Project was born. I wonder though where we would be today if the Canadian government had understood and seized the opportunities that the space community was telling them was there at that 2010 workshop. I wonder how many other opportunities Canada is missing out on. 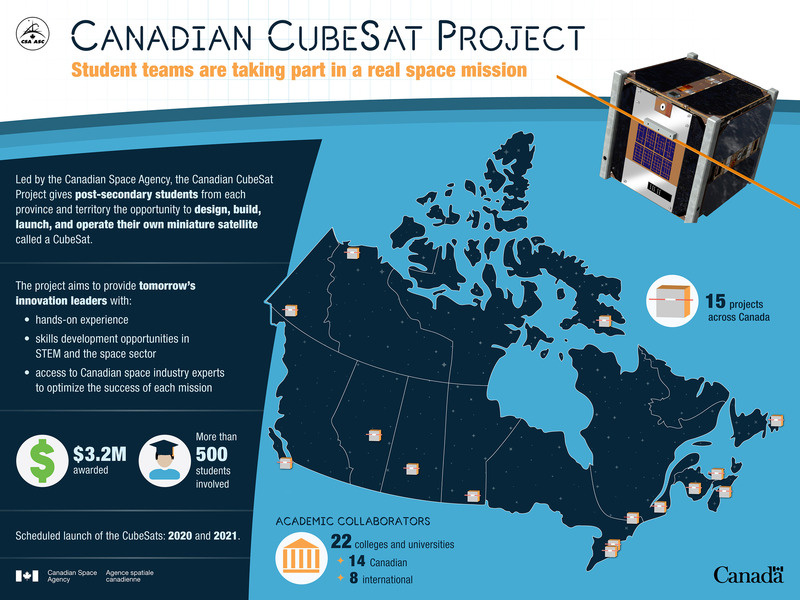 Canadian CubeSat Project at a glance. Credit: Canadian Space Agency. Expand our open-source platform to include accessible, open-source satellite software, electronic, and mechanical designs to increase Canadian and world access to space. Test an imaging instrument designed to collect information for predicting, tracking, and monitoring the impact of wildfire on vegetation and land. Fly a flux-gate magnometer, an instrument designed to monitor and better understand the effects of space weather on our communications systems. Develop and test new advancements in technology to better understand “dark energy,” an enigmatic form of energy making up 75% of the universe believed to cause the universe to expand at an accelerating rate. Operating with two payloads, ORCA2Sat will calibrate a number of both optical and radio observatories in an effort to reduce uncertainties associated with measurements of the universal expansion rate. These calibrated measurements may provide new insights into the nature of dark energy and the universal expansion rate. Study how space conditions affect the composition of asteroids and the Moon so that researchers on Earth can better understand those effects when studying their cousins, meteorites. This mission will also help better understand the origins of asteroids when we combine this data with the data from asteroid sample-return missions, such as the OSIRIS-REx mission. Provide new insights into the behaviour of Earth’s upper atmosphere including the ionosphere. CubeSat NB will receive signals transmitted by global navigation satellite systems, such as GPS, as they travel through the ionosphere and are affected by it. Researchers will be able to use the data to further study how the ionosphere changes from place to place over time as well as how it responds to space weather. Significant space weather events can interfere with communications systems and electrical grids. CubeSat NB will also carry three cameras. Two cameras will allow the team to study the distribution of oxygen in the upper atmosphere, capturing images of the red and green light oxygen atoms given off during aurora and airglow events. The images will be used to examine the varying composition of the ionosphere and its response to solar storms. The third camera will be used to take images of Earth’s surface for Earth science and meteorology applications. Knowledge of Earth’s oceans is critical to the understanding of climate change. Test an existing technology designed to monitor oceans (sea-ice detection and sea-ice concentration estimation) and fit it on the smaller CubeSat frame, which could lead to cheaper solutions to monitor and collect data on our oceans. Promote and share Indigenous culture across Canada through northern images, a project that will take northern art to space, where pictures of various pieces will be taken with Earth in the background. Promote and share Indigenous culture across Canada through northern voices; engage amateur radio across the country with stories and messages in Indigenous languages. Promote and share Indigenous culture across Canada through games; create a globally interactive game for amateur radio operators. Special recordings played only in certain geographic zones will require global cooperation in order to decode a whole message. Messages and content will be developed on the subjects of northern Indigenous history and language. Test a new CubeSat frame made out of lightweight metal alloys to provide better space navigation capabilities for future CubeSats. Validate the use of onboard solar energy and battery storage technology to power a stabilization wheel that will better control the position of the satellite’s instruments. Conduct a flight-test with a novel imaging system for engineering technology demonstration with the potential to provide virtual reality-ready images. This imaging system has future applications in Earth observation and space exploration. Testing will demonstrate imaging modes for different in-orbit functions. Enhance science, technology, engineering, and mathematics (STEM) outreach of Western University’s Centre for Planetary Science and Exploration (CPSX) by taking CubeSat operations into the classroom. This will include students from Southwestern Ontario schools and Nunavut Arctic College. Remote access to the CubeSat will facilitate live demonstrations of how to send commands and how to interpret data received. These activities will complement the existing classroom activities and build upon previous work developed at Western in enabling remote access to laboratory equipment. Test an instrument that may offer new ways to measure the amount of radiation to which astronauts could be exposed during spacewalks, as it poses serious risks to their health. This instrument has the potential to replace current dosimetry equipment on board the International Space Station. Its measurements will be used to identify high dose rate areas and incoming solar storms, and to improve radiation modelling tools in preparation for future deep-space missions. Test a Canadian-developed wide-angle camera to observe snow and ice coverage in Northern Canada. The information collected through its images could help map the thawing of Arctic ice and permafrost and give a better picture of the impacts of climate change in the region. Test a solar energetic proton detector, provided by the University of Sydney, to collect data that will enable a better understanding of the effect of Solar Proton Events (SPEs). SPEs are the result of solar activity during which radioactive protons emitted by the Sun become highly energized. The level of radioactivity caused by such events can penetrate and cause damage to the structure and electronic components of spacecraft in their paths. Understanding these events and their effects could help improve the design of CubeSats so they are more resistant to radiation. Develop and test an imaging system for precision agriculture. The system will be able to capture precise soil and crop data (texture, topography, moisture content, weed and disease infestations, crop damage, etc.) as well as verify the effectiveness of herbicide and fungicide applications, monitor physical damage due to insects, inundation, wind and hail, and schedule an irrigation plan. The goal is to develop better monitoring systems to promote greater sustainability. Test an imaging instrument to collect data on dust measurements and study the effect of climate change in the Kluane Lake region. Evaluate the viability of a new electronic component that shows better resistance to the harsh conditions of space and that could improve the cost-effectiveness and performance of future CubeSat computers. Conduct one of the first demonstrations of a quantum sensor in space. Quantum sensors use the unique and often strange behaviour of matter at very small distances to perform ultra-sensitive and robust measurements. This quantum sensor uses nitrogen-vacancy defects in a tiny piece of diamond to measure the intensity and orientation of the magnetic field in space. Such measurements are useful to study the effect of solar storms on radio communication, GPS or electrical grids, or the flow of magma under Earth’s crust, for instance. Quantum technologies, such as this magnetometer, will lead to smaller, more energy efficient, and more sensitive sensors for space applications. Study how materials degrade in space by looking at how useful construction materials are affected by extreme temperatures, radiation, and space debris in low Earth orbit, and by studying material changes in colour, texture, brittleness, and electrical conductivity. The results of the study could lead to more cost-efficient solutions for the space sector. Coding challenges open to Yukon youth and the public, using data gathered from YukonSat. For example, students could be challenged to create a collage of satellite images of a certain region of Earth. Coding challenges to transmit and receive short voice recordings. Yukon schools, First Nations, communities, and other groups will have the opportunity to spread their messages to other parts of Canada and the world through a scavenger hunt-style challenge. Data analysis and interpretation completed in Yukon College math and science courses. For example, students could learn about instrumentation, signal processing and data analysis methods while completing an activity to map earth’s magnetic forces using GPS and magnetometer data from a satellite built by their peers.